The world of business is evolving. 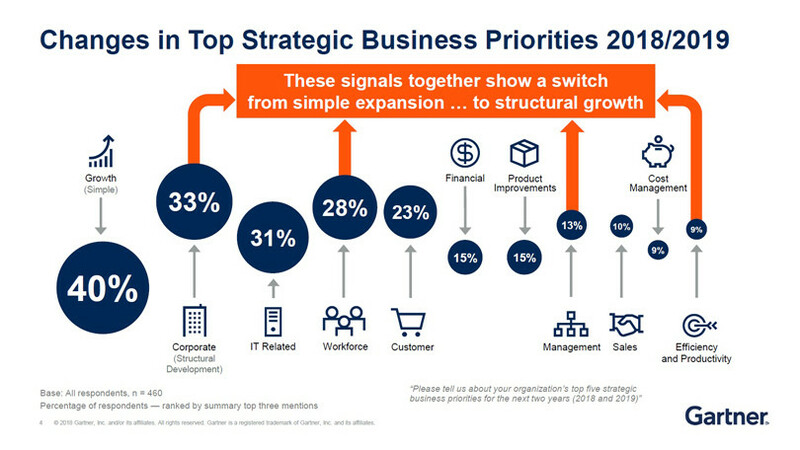 At their last Symposium conference, Gartner showcased its annual studies of CIO priorities and CEO perspectives. Their research shows how CIOs and other top IT leaders are emphysising the need for structural growth. Now more than ever, it is vital to pin-point the specific initiatives to support adapting business models, drive consumer engagement and optimise the workforce. 1. As your business changes, are your telecoms keeping up? 2. Are they aligned with your business objectives? 3. Does your connectivity support your digital transformation strategy? 4. Are your telecoms as streamlined and future-proofed as they can be? 5. Are you making the most of the latest technologies? 6. Do you know how much connectivity and communications are costing you each month? whether you’re paying too much or for more than you need? 7. Do your office telephony and mobile networks link to the cloud, to your CRM and to your other business-critical applications? 8. What happens if you experience a systems failure? Does it have an impact on your entire network? Unless you’re an IT or telecoms professional, chances are you won’t know how to answer the questions above. Does this sound familiar? A Connectivity Health Check session will put you back in control and help you get a grip on your telecoms. Today’s consumers are a savvy bunch. They expect better customer service, faster response times and unified communications. They’re also not afraid of letting the world know when they receive bad customer service. It can be a challenge for businesses to keep up, especially if there are inefficiencies within an organisation’s telecoms infrastructure. Developing your telecoms network goes further than investing in a wide range of products and services at the lowest prices. In today’s interconnected and ever-changing technical world you must take into account how your telecoms will support your overall digital transformation strategy and how flexible and balanced they are to ensure synchronised growth with your whole organisation. These days the global marketplace enables much more flexibility where employees are able to work different hours and also remotely from multiple locations too. While this modern way of working brings undoubted business benefits, it can also result in increased data use and cost and poses much greater security risks. Click below to receive your very own personalised strategic telecoms review.